Atlanta Rod manufactures specialty Brass Fasteners including headed bolts, studs, and nuts to your custom specifications, and we guarantee to meet your delivery schedule. At Atlanta Rod and Manufacturing Co., Inc. we strive to provide our customers with the most innovative products and quality materials in the industry. Atlanta Rod & Mfg. Co., Inc. manufactures Brass headed bolts from 3/8” to 2 1/4” in diameter. 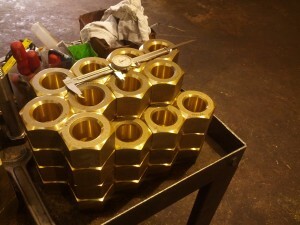 We also precision forge Brass nuts in-house and stock them for your construction project. 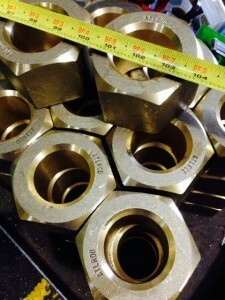 Our in-house Brass nut forming capabilities range from 3/8” to 4” in diameter. We can also provide your Brass fasteners in metric sizes as well. Atlanta Rod offers domestic certification of melt and manufacture for all Brass nuts and bolts.